As we already know, there are several interesting options and filters for the main movie list in Movienizer. 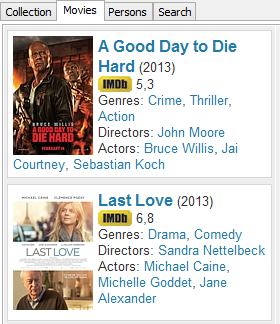 In particular, you can choose between the detailed movie list (default) and the cover list. However, it is possible to make some further adjustments. In the settings window, select the "User interface" tab. Here you can see all available user interfaces (themes), the active interface is highlighted. Just below the list, click the "Settings" button. This opens a window with various settings for the currently active interface (for a different interface, different settings may be available). Find the areas highlighted on the screenshot above. The "Cover list options" area refers to the cover list mode (does not have any effect on the detailed list). Cover dimensions. Here you can enter size (in pixels) for movie covers in the cover list mode. The first value is width, the second one is height. Cover cell dimensions. If you take a closer look at the cover list, you will see that it consists of fixed blocks. Each block contains a cover, some information (movie title) and some free space to keep it all separated from other covers. This block is a "cover cell". As you can guess, a cover cell should be bigger than a cover, otherwise no free space and no movie title will fit into it. The cover cell settings also apply to photos of persons (if shown as the photo list, similar to the cover list for movies). Cut covers to fit the given dimensions. Cover images may have different aspect ratio. Thus it is not always possible to resize a cover so that it would fit into the given dimensions exactly. There are two possible solutions. First is to cut the side that does not fit. 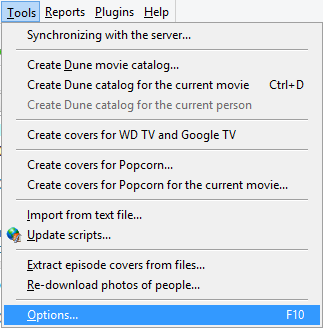 With this option enabled, Movienizer does just that. The other solution would be to resize the image without keeping its proportions. This is done, if you disable this option. The "Photo dimensions" and "Cut photos to fit the given dimensions" options refer to the "photo list" of persons and have the same meaning as the corresponding options for covers. The rest of the highlighted options apply to the detailed list of movies / persons. Show covers in the movie list. This is enabled by default. If you disable it, no covers will be displayed (see an example below). 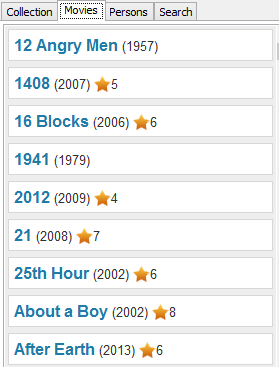 Show only titles and years in the movie list. If enabled, this switches off showing information about directors, actors, seasons in the list. Cover / photo width in the list. This allows you making covers and photos in the detailed list bigger or smaller. Just enter the desired value in pixels (as of this writing, the default value is 80 pixels). Height is adjusted automatically, keeping the original proportions. Some adjustments that you make for one interface will be also applied to other interfaces, so that you can switch between interfaces comfortably, keeping your preferences.